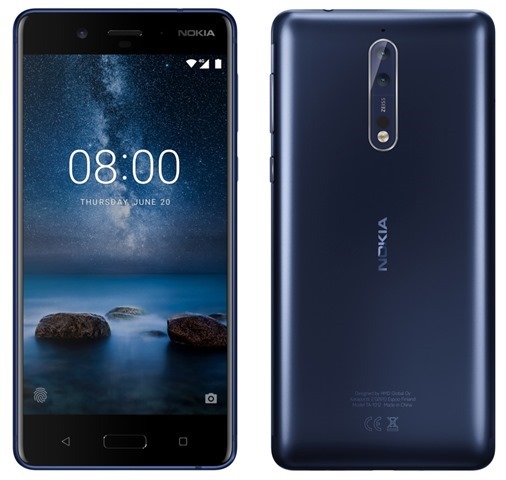 Press renders of the Nokia 8, HMD Global's upcoming flagship phone, have been posted online by renowned leaker evleaks. And this is the phone we have been waiting for. The device has a home button on the front, which is the fingerprint scanner (you can see the fingerprint unlock icon on the screen), and soft keys for the recents and back buttons. We can see that the Nokia 8 has a metal body, and there is no speaker grille on the back or the front panels, so we can safely bet it is on the bottom of the device. A 3.5 mm audio jack can be seen on the top of the phone, while the metallic keys for the power and volume rocker buttons are on the right edge of the frame. According to benchmarks, the Nokia 8 is powered by a Qualcomm Snapdragon 835 processor, and will be available with 4GB or 6GB of RAM. The phone will feature dual rear cameras comprising of 13 megapixels lenses, from Carl Zeiss. The device allegedly sports a 5.3-inch QHD display, and will run on Android 7.1.1 Nougat. The device has the model number TA-1012, and scored 2237 for single core, and 7587 for multi core tests on Geekbench. That is actually higher than the Samsung Galaxy S8's scores of 2121 and 7101 respectively. But if anything we know not to trust benchmarks, as OEMs can easily game it to create hype *cough* *OnePlus* *cough*. There are rumours floating around that HND Global will announce the Nokia 8 on July 31st. And now for some bad news. and yes as you may have guessed, the price is the issue. According to WinFuture, the Nokia 8 will be priced €589 (which is about Rs.44000 or $675). This will put the phone out of reach for many people, who may opt for more affordable Phones such as the Honor 8 Pro, or the OnePlus 5. The Nokia 5 will be available in Blue, Steel, Gold/blue, and Gold/copper colours. Nokia 8 leaked press renders reveal dual rear cameras.